This main course salad is an ideal lunch or light supper option. Cook chicken with a little lemon juice and water until slightly browned. 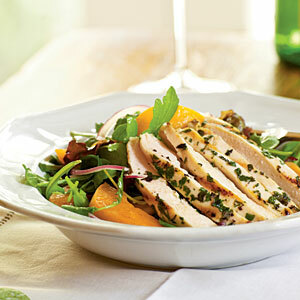 Lay chicken slices on top of arugula salad and top with fruit and a dressing made from your fruit of choice. Examples: Strawberry vinaigrette, grapefruit vinaigrette, spicy orange dressing etc. See recipes for dressings, sauces, and marinades.